NOTE: Prayer beads are sold separately. Order beads at Kristen's site: www.prayerworksstudio.etsy.com. Do you ever struggle with prayer? Maybe your mind wanders, you wonder if God even hears your prayers, or you just don't know what to pray. Is it really okay for Protestants to use beads in prayer? What do the beads mean? 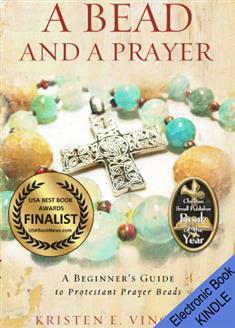 How do I use prayer beads? Praying with beads may be exactly what you need to stay focused in your prayers. Consider sharing this experience with your prayer or Bible study group. Youth also enjoy making the prayer beads and learning to use them. The book includes a Leader's Guide for groups.